In the end, our Thermal Simulations demonstrated that for our location, climate and site orientation the windows and insulation would be critical in providing an efficient building envelope. In fact, a well insulated building with high performance windows was our minimum design criteria. Our analysis accounted for the size, location, R-values, SHGC of all the windows; the types of insulation used in the walls, floors and ceilings; solar insolation at the site; air changes / hour as well as the different types of thermal mass in the house. Our craftsman style house had a lot of wood in the design including the very dense Acacia wood in addition to the normal furniture, cabinets, tables, granite, tile, etc. Our simulations showed us that this incident thermal mass would indeed help to moderate temperature swings in the house. We can look at a few of our simulations for PDR, called "runs" to help demonstrate things. Take a look at the (1) Run Comparison and (2) Detail Sheet below. It is probably easier to talk about these or answer you specific questions - send an email with your questions. 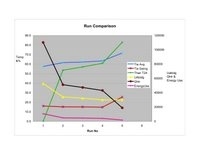 A summary sheet or "Run Comparison" is prepared that graphically represents the relative change in performance of the different design decisions. A number of performance metrics are used. A "Detail Sheet" with all the specific run data is created for each design. 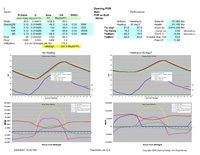 The Details Sheet records all the relevant design decisions; graphs the 24-hour temperature and heat flow (Q) data, and tracks the changes in a critical set of metrics.